In a summer with so many rainy days one appreciates the few sunsets you can have. Not least here by the Atlantic Coast where you face the big ocean to the West. Some more from the net about the Atlantic Road: A unique stretch of road which takes you right out to the ocean’s edge. In 2005, the road was voted Norway’s «Engineering Feat of the Century», and is also known to be the world's most beautiful drive. It connects Averøy with the mainland via a series of small islands and islets spanned by a total of eight bridges over 8274 meters. The road was opened in 1989 and is toll free. 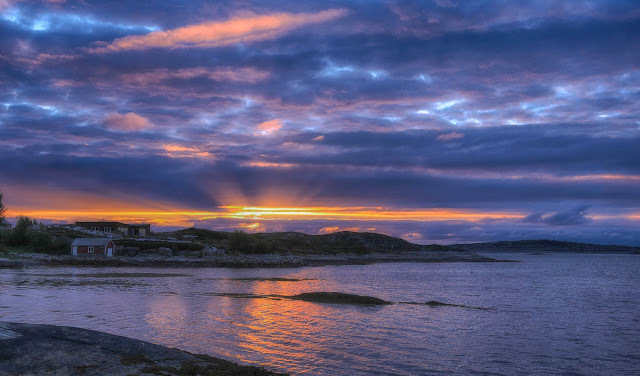 The Atlantic Road has National Tourist Route status and the entire stretch between Bud and Kristiansund is one continuous experience packed with coastal scenery, culture and history.